The Contest Winner for January 2011 is Ted C. from Eagle, Idaho. 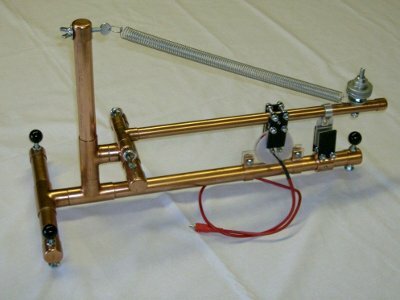 He uses various K&J magnets to create some incredible seismometers. His instruments are able to measure earthquakes next door and around the world. Above: Seismometer with a Slinky! From Wikipedia: Seismometers are instruments that measure motions of the ground, including those of seismic waves generated by earthquakes, nuclear explosions, and other seismic sources. Records of seismic waves allow seismologists to map the interior of the Earth, and locate and measure the size of these different sources. 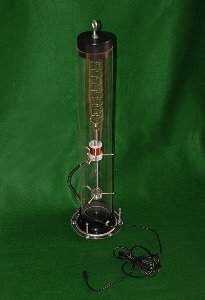 Basically, it's an instrument that measures motion. You place it somewhere that is sturdy and doesn't move, and it will measure any motion from earthquakes, etc. Each seismometer shown measures movement in only one direction, or along one axis. Professional seismic observatories usually have three individual instruments measuring three axes: north-south, east-west, and the vertical. If only one axis can be measured, this is usually the vertical because it is less noisy and gives better records of some seismic waves. Ted's seismometers are based on a number of typical methods. You can find many descriptions by searching for, "Lehman Seismometer." They consist of a heavy weight on a long arm that has a natural frequency with a long time period. That is, if you pull it off-center and let go, it takes many seconds for it to cycle up and down, back to the stable center-point. The sensor consists of a coil of magnet wire on the stationary base, with a pair of strong neodymium magnets on the movable arm. The coil is made from single-strand copper wire that has a thin layer of insulation. It's often used in transformers and coils in electronic devices. A coil is wound with several thousand loops of thin wire. When the magnet moves, the magnetic field in the coil of wire changes. Thanks to basic physics, a changing magnetic field in a wire causes a current that can be measured. The wires of the coil are typically hooked up to an amplifier (because the changes are very small) and an analog-to-digital converter that lets you view the information on a PC. In the animation at right, the stationary base is blue. It is made from a non-ferromagnetic material like aluminum. Magnets don't stick to it. The orange arm is hinged at the left, and holds the big, heavy counterweight shown in green. A steel cable to the top of the structure provides support for the arm. There are two items sticking up from the blue, stationary base. The one at the left holds a coil of magnet wire, shown in red. Notice that the arm holds two magnets, above and below the coil. They are oriented such that they are attracting towards one another, which makes a strong, uniform field between them. When the magnets move, the field in the coil of wire changes. To the right of the coil is a piece of aluminum sticking up, also surrounded by a pair of magnets. Why? The whole system needs some damping, or something that will make it eventually stop. When something moves the arm, it could wobble back and forth for a long, long time if the hinge point has minimal friction. By projecting a strong magnetic field into a piece of aluminum, eddy currents flow in the aluminum when the arm moves. This gradually slows it down, acting as a gentle break to motion. In older seismometers, a paddle was often placed in a liquid bath containing water or oil. The drag of the paddle moving through the liquid would slow it down, dampening the motion. Since the level of the liquid requires maintenance, the method of using eddy currents can be much more consistent and maintenance free. Not shown are the two wires dangling off the coil of magnet wire, which gets hooked to to some device to read the changes in current. Before inexpensive PCs were so accessible, this used to be recorded on a chart recorder. Today, an amplifier and an A-to-D (analog to digital) device sends the information to a PC. There are various software packages available for handling the data (see below). 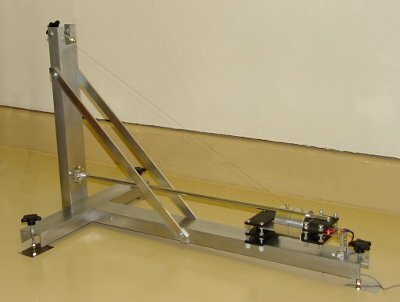 Vertical seismometers work in a similar fashion, but record motion in the vertical direction. Some examples include the two at right. One uses a part of a slinky as the spring mechanism, while the other uses a spring on an arm with a counterweight. In both cases, the weight is moving up and down, not side to side. When setup properly, these devices can be extremely sensitive. In fact, you have to be careful to set them up in a very stable location that isn't affected by slamming doors, jumping kids, or even changes in temperature. We found one article that described a hobbyist's struggle to overcome the noise introduced by the daily heating and cooling of the cement slab floor in his garage. The motion of the concrete heating and cooling unevenly from the sun was actually seen by the seismometer. Wow! Check out this page that shows the latest earthquakes recorded using a trio of Ted's sensors at Boise State University. You can find data on nearby quakes in Nevada or California, or even bigger quakes from around the world. Yep, that was our first question too. Talk about a seriously cool science experiment. We haven't done the research from A to Z on this one yet, so please don't ask us about where to find the best A-to-D circuit, or what the ideal time constant of the arm is -- we don't know! Still, here's a few things we found while researching online. If you're interested, there are a number of sites out there with various levels of how-to instructions. Good luck! Lehman Seismometer - Text file from the July, 1979 Scientific American, "The Amateur Scientist." 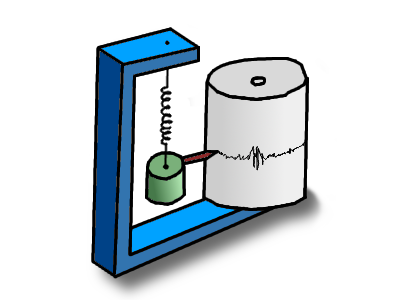 How to build a simple seismograph to record earthquake waves at home. The latest earthquakes as recorded by some of Ted's instruments at Boise State University. Inge Lehmann - a female scientist who discovered that the earth's core has a solid inner core, all from analyzing seismometer data.